Congratulations to this year's joint winners both from St. Pauls School. Giles Hargreaves, Quentin Geroult partnering Roman Evans, Max Fleming partnering Joe Benton, Patricia Davenport presenting the cup. The winning score was 61% - Roman will be able to defend his title next year. As we had two children pull out through illness we had some last-minute adult substitutes: thanks to our trustees, Patricia Davenport and Giles Hargreaves and also to James Handscombe, headmaster of Westminster Academy - responsible for bringing 8 pairs and also to Morten Bilde, who had flown over especially from Denmark, where he also teaches bridge in schools, having given up his paid job two years ago to dedicate himself to children's bridge. We split the event into two sections of 5 tables with three boards played at each table. The Portland Club provided delicious refreshments and the best card-room in the world. Twenty teams competed this year for the Schools Cup. The leading four teams went through to the semi-finals. These were Westminster, Eton, Dragon A and St. Pauls A , placed 3rd - 6th at half-time. First and second at half-time were the two mixed teams not reprsenting a school, and so competing for the Scully Trophy. Interestingly these teams were two of the few containing girls. The victorious Westminster team led by Liam Sanderson ended a run of 7 victorious years for the Haberdashers team. Morten Bilde took 6 children from Denmark, ages 10-15 to the famous bridge-playing village of Raibidpura in Madhya Pradesh in India. As a result over 150 children are now keen to learn bridge. Here is a short video piece from local TV coverage - the visit received widespread interest with lots of newspaper coverage and exposure on three TV channels. Children at Carmyle Primary are now obsessed with the game. Over 100 junior players took part in the Young Bridge Challenge in Loughborough on 5th March. The event was organised by English Bridge Education and Development. The second slam from yesterday's Surrey Schools Cup was bid at one table by Joe Benton and Max Fleming from St. Pauls. Note there is no need to use Blackwood 4NT. "Never Use Blackwood with a void" is exemplified here - one South used RKCB - Roman Key-card Blackwood, where the King of trumps is counted as the fifth ace. The response of 5D (showing 1 or 4 out of the five aces) left South uncertain whether the 'ace' in question was the King of trumps (vital) or the Ace of diamonds (less useful). There are in fact 13 tricks available owing to a fortunate distribution in the diamond suit. If Diamonds can be trumped 3 times the Ace and Queen will fall, leaving dummy with two winners to dispose of the club losers. There is one spade loser in the South hand which can be trumped in dummy. Careful timing is required as you have to trump diamonds three times and then return to dummy to enjoy the established diamonds once trumps are drawn. Four entries are needed: Three trumps and the King of spades. Win the trump lead (safest) with dummy's Jack, trump a diamond, cross back to dummy's King of hearts, and trump another diamond with West's Queen falling. Cross to the king of spades and trump a third diamond, establishing two winners as West's Ace falls. Trump the Jack of spades with dummy's 4 of hearts and play the winning diamonds, throwing clubs. The South hand is now good. 13 tricks - not a grand slam I'd want to be anywhere near as it requires a miracle lie in diamonds. One core principle of the two over one bidding system as played by most experts is that a new suit response at the two-level is 100% game-forcing, thereby allowing more bidding space. One heart promises 5 cards. The 2D response is game-forcing, promising 12+ points and 4+ diamonds. The 2H rebid is unlimited. The 4H bid seems simple but in fact shows a minimum hand given the context of his 2D game-force. North being aceless and with a weak singleton king uses the "Principle of Fast Arrival" to show his lack of interest in slam. PFA is simple. If you are in a game-forcing situation, bidding straight to game is weaker than bidding slowly. So a 3 Heart bid by North (instead of 4H) would show some slam interest and invirte cue-bidding. Robbie King with the look of someone who's just bid and made a small slam. Thanks to Dr Gill Bamford (right) and Daniella McBride (left) for their dedicated assistance. Congratulations to the B team (Matt Townsend and Joseph Cohen, Max Allenby-Bassett and Leo Hessian), narrowly beaten to a creditable 5th place. It has been a pleasure to continue Natasha Ceron's fantastic work fulfilling the David Davenport Trust's aims of nurturing young bridge talent. Our mission is to inspire those in school to play bridge as a way of enhancing mental faculties while learning and practising a range of invaluable skills. Next stop the Schools Cup on March 5th to hopefully challenge Harberdashers astounding monopoly of the Cup over the last umpteen years. Robbie King (pictured playing) had to leave before the scoring was complete so is missing from the photo. KCS Bridge club meets this Thursday at lunchtime, so there will be a little celebration and acknowledgement of their achievement (and of course a complete photo). I will be in attendance so would like to invite any new to bridge and willing to learn to come along. In total there were 52 players - 7 tables bridge, 6 tables mini-bridge. Auspicious numbers. Bridge players played 18 hands, three against each team. I will be analysing one hand a day on this page. Feel free to ask for clarification. I'm coming to teach your school bidding very soon! We welcome feedback and referrals. Please subscribe and help expand youth bridge. The David Davenport Trust is here to support bridge in your school. Robbie King correctly opened the hand 1S: the first positive bid in the auction in modern bridge promises 11-22 points and occasionally 'opening the bidding' when 10 or even 9 point hands are upgraded with good shape. Conversely good 21 or 22 point hands, especially with a 5-card major are opened 2C as they rebid cheaply after the ubiquitous 2D response from partner. 2D was traditionally a negative response showing 0-7 points. Simple and effective. Experts recommend bidding 2D as a waiting bid on most hands, allowing partner to rebid a major or 2NT, 'right-siding' the contract with the opening lead coming up to the strong hidden hand. They had agreed to play "Weak Two Openers" and this hand is not good enough with the singleton King for 2C Game Force.....If you put the King in the club suit the hand is now worth 2C with the strong majors - partner needs just 4-3-3-3 and the Jack of clubs to give you good options - those balck tens are valuable. Robbie as East did not need a second invitation when Jack Hagger (second right) responded 3S, (a splinter is possible on this hand but 4-4-4-1 is weak and the singleton ace can mislead when splintered so Jack's 3S is a good choice with a new partnership ) Robbie leapt to 4NT and found the one ace he needed (5D response), and then bid 5H - another code bid asking about the Queen of trumps.... Jack had it so Jack bid the slam - 6S (denying an oustide king en route). Twelve out of thirteen tricks needed.......the pressure was on. Robbie made short work of the play: There are 11 tricks on top (5 spades, 3 hearts, two diamonds and one club) presuming the King of diamonds loses to the ace. So he drew trumps, leaving one remaining in dummy which he used to trump a club in dummy for his 12th trick. He made six spade tricks rather than five throwing the other two clubs on the established QJ of diamonds. One West opened the hand 1D which I think is bold but great - vulnerable and all. Those QJs with backup 8s and 9s are better than the sum of their parts. The singleton ace a little bit dubious and the vulnerability more so. Better to do this in 1st seat than second. Few experts would open this as 4-4-4-1 bids and plays badly, but 10 years from now many, many more will. Opening the bidding is such a huge advantage. For instance the mini 1 NoTrump opening bid is a devastating tool not vulnerable - it shows 10-12 points so you are opening some very poor 10 count hands just to dismantle the 1-level options for your opponents, not afraid to lose 50 or 100 points if you go down. East mistakenly went to 3NT in response to 1D and that was that. The correct response is 1S - bidding a new suit is unlimited in strength, promising 4 or more cards (of any quality)....5-26 points. That way you allow partner to make a simple rebid (2S on this hand) and East will then drive to slam. There are 12 tricks luckily available in NTs with the thirteenth heart providing a winner in the West hand, provided a club is not led which establishes a second trick for the defence in the King of clubs with the ace of diamonds still unplayed. In teams scoring there is no benefit in trying for the extra 10 points - only in pairs should you bid 6NT. Tom Lyster (St Pauls supremo) - thanks for hosting such a successful event. The many others, Tim Warren (Surrey CYO), Deborah Casey, Sarah O'Connor (who runs the England Under 15s girls squad) Douglas Wright and the mini-bridge team. My apologies if I've left any names out. The draw of a screen, for pleasure or learning, is enormous these days for children. So getting back to basics with a tangible pack of cards provides children with a practical and tactile experience. “Children are learning without realising it and exercising a whole host of other skills too, from turn-taking and communication to problem solving and team work,” says Mike. Traditional games like ‘Patience’ help children recognise and play with numbers. “The main aim of the new maths curriculum is not only for pupils to learn number facts but to become fluent with them, too, and card-playing allows children to do just that,” explains Mike. A simple pack of cards allows children to practise many different elements of maths, from core skills like addition and subtraction to more complex concepts like fractions and probability. Alongside conventional card games there are many which have been adapted to help children develop a particular skill like strengthening number bonds or getting to grips with positive and negative numbers, for example. Well-liked games like ‘matching pairs’ are a great way to enhance memory. Children learn how to retrieve information in a relaxed setting while developing patience and perseverance. Get grandparents involved, too (according to the National Institute of Ageing, card games help stimulate the brain cells and keep the neural pathways functioning!). Card-playing will undoubtedly speed up your child’s maths thinking brain – a key skill required for academic tests such as SATs. “Just like working in a shop before the age of computerised tills, a few weeks of game playing means their mental maths could seriously go through the roof!” says primary teacher Sarah Poulton. Children can learn new strategies for storing and retrieving information, categorising patterns, sequencing and sorting by playing cards. It will also quicken up their reflexes – both mentally and physically. Just think how quick off the mark you need to be to reign supreme in ‘Snap’! Plus it’s fun! But cards can be challenging and highly competitive – think Rummy and Pontoon (Black Jack) – and someone has to lose, so beware! Great article and video check it out. For educators, this list offers a helpful orientation to parent concerns that you may wish to address directly in your parent engagement communication. I’ve collected some of these common concerns from some recent appearances, with the help of my super-smart new intern, Polina Senderova, a student at the Medill School of Journalism at Northwestern University here in Chicago. Kids love their video games. If left alone, many kids would have no problem at all spending an entire day building and exploring on Minecraft. While this type of gaming does have its benefits, most adults will agree that a day-long gaming marathon is excessive. At what point should you pull the plug on playtime? Sometimes, kids will choose playing with a computer over playing with their friends. While gaming can be social, is this damaging to their socialization? Does excessive screen time cause kids to miss out on learning how to deal with important social scenarios? How harmful is the lack of real, face-to-face interaction to their social development? “But I need my computer to do homework!” Children can’t be good students without finishing their work, often on computers and/or tablets. But computers, tablets, and other devices are often multi-purpose. That means that they also have games and other opportunities to connect with friends. When tempted by things more fun than homework, how is it possible to let kids use technology but still keep them focused? A major cause of social stress for children and teenagers is the Fear Of Missing Out, or FOMO. Will the sad feeling of not getting invited to the birthday party be made worse by scrolling through the group selfies from the party on Instagram. How do we avoid this, and how do we deal with it if it arises? Rest in Peace, Red Pen. With tablets replacing traditional homework methods, parent involvement almost inevitably decreases. This is a surprise to some parents—something they weren’t expecting. When it’s harder to see teacher feedback on homework, how can parents bridge that gap with educators in order to continue to help their kids in the same way? Do you share some of these concerns? Do you have other concerns about children and technology that I haven’t addressed here? Let me hear from you! I’ll be sharing solutions and strategies for each of these concerns on my blog and in the book that I’m currently writing. For some answers right now, sign up on my email list to get my eBook: A Dozen Tips to Help Your Family Thrive in the Digital Age. That way, you can be in touch and participate in the conversation. You can sign up for my newsletter here. Looking for a way to help your children take turns, follow rules, learn math and memory skills and face competition in a healthy way? How about a game of Crazy Eights? Card games can teach math and memory skills, as well as strategic thinking, psychologist and sociologists say. Also, the conversation and friendly rivalry that come with sitting down to play cards can strengthen family ties. Family games also can build children’s confidence: The rules are the same for everyone, and it is fun to play a game in which anyone can win. Ms. Brett often carries a deck of cards in her bag to play during spare moments such as waiting for a pizza. The family plays with Ms. Brett’s parents, who are in their 80s, on summer vacations at a lakeside camp in Vermont. Card-playing has honed her children’s memory skills and taught them to plan competitive strategies in advance, Ms. Brett says. Bridget, who struggled with basic math as a young child, says playing cards helped her gain confidence and skill. 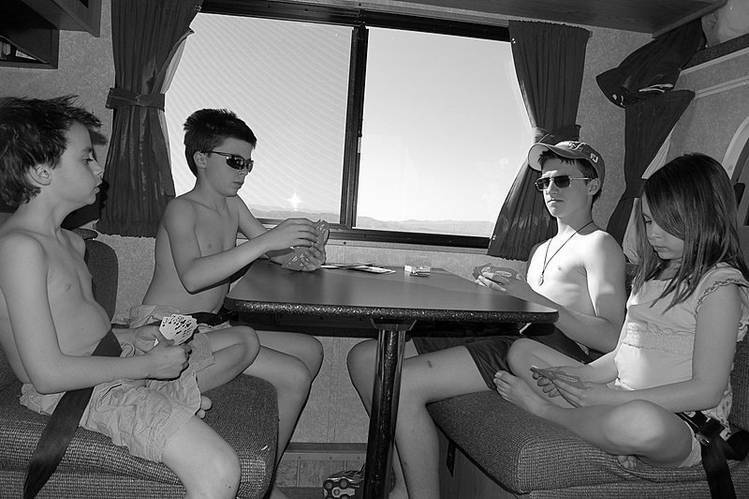 At a time when children’s schedules are packed and digital distractions are everywhere, youthful card sharks are increasingly rare. “A whole generation of consumers didn’t learn to play cards the way an entire prior generation did,” says P.J. Katien, vice president, sales and marketing, for the U.S. Playing Card Co., Erlanger, Ky., owner of the venerable Bicycle, Bee, Kem and Hoyle brands. Still, he says he sees interest among young parents in teaching their children card games as an alternative to videogames. Sales of traditional playing cards have risen between 1% and 2% industrywide in the past two years, he says. 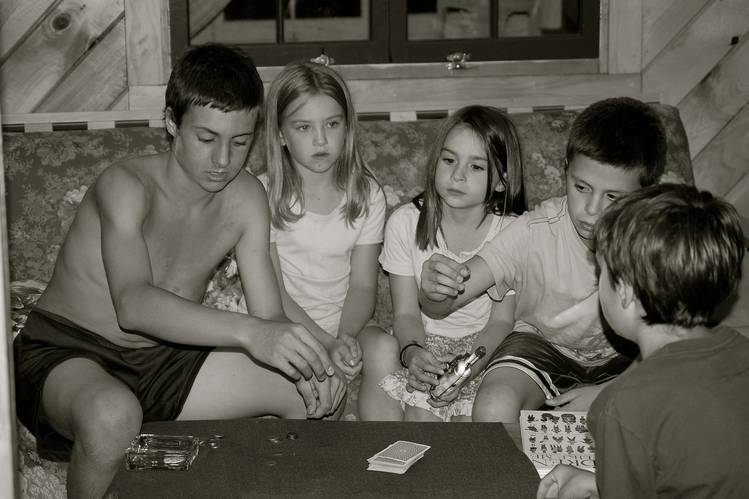 Tim Sullivan of Attleboro, Mass., says playing a card game his family calls “Tim & Louise” kept him, his wife Ellen and their four children entertained for hours during this past winter’s blizzards. (The game, a simple trick-taking game that originated in the 1930s, is known by many names, including “Oh Hell” and “Oh Shoot.”) His children, ages 9 to 16, are naturally competitive, and card games teach them to take teasing as well as dish it out, Mr. Sullivan says. Their 9-year-old daughter, Molly, takes pride in holding her own against her parents and older brothers. “It feels good to beat them, and it makes me feel like I can do more,” she says. That confidence comes in handy in basketball, swimming, softball and going on “scary rides at the amusement park,” she says. To get children hooked on cards, some families start by teaching their children beginner games, such as War and Old Maid, when they are small, and challenge them with a variety of games as they get older. A regular family game time, say, on Friday nights, can help. Many parents also make sure their children see them having fun playing. 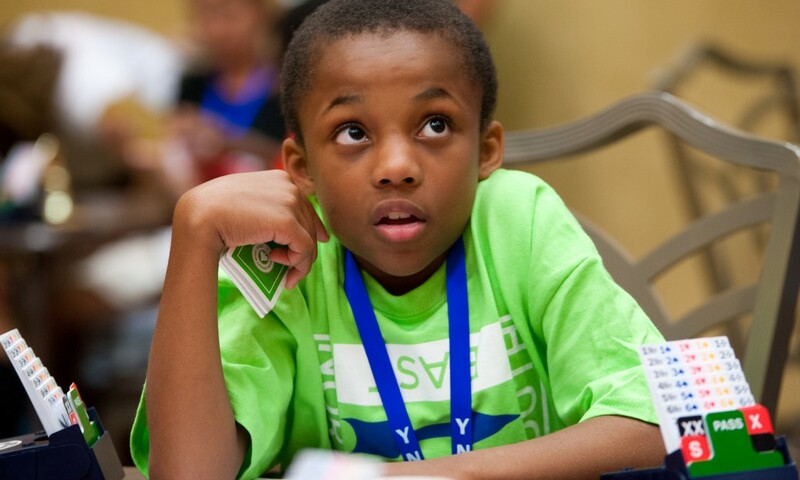 Both card and board games are linked in research to better math skills in small children. Both create opportunities for face-to-face play, conversation, taking turns and following rules. Parents say it is easier to interest video-savvy children in colorful board games with splashy graphics than in staid-looking playing cards. Game designers are flooding the market with creative new board games. And sales of “hobby games,” or nontraditional tabletop games ranging from Dungeons and Dragons to collectibles such as Pokemon, have been rising 15% to 20% a year since 2010, according to ICv2, a trade publication. Sales of family board games such as Monopoly and Clue rose 5% in the year ended Feb. 28, according to the market-research firm NPD Group. Traditional card games can be more engaging in other ways, however. For small children, card games tend to provide more counting and matching practice. Shuffling and dealing cards can instill greater manual dexterity. And skilled card-playing often calls for more nuanced social skills, such as bluffing one’s opponents into unwise bets. Some grandparents impress youngsters with their skills in counting cards—remembering which cards have been played so they can anticipate opponents’ next move. Fifteen-year-old Matthew Siegel says learning to keep a poker face while playing Texas Hold 'em with his grandfather, 78-year-old Victor Spetalnick of Valley Stream, N.Y., has served him well at school. “I’ve had my share of being teased, and keeping a straight face and not looking like it’s getting on your nerves is helpful,” says Matthew, of Armonk, N.Y.
“You don’t win everything in cards. You can’t expect to win everything in life either,” she says. I recently received an email with a great suggestion from reader Erin for a game to use when teaching bridge to kids. I would love to hear other useful suggestions and experiences in the comments to this article. Share what worked for you with other teachers. Erin said “I came across a game a long time ago which is useful to teach to kids before they learn bridge. It’s very simple. Take the honours out of a deck of cards (AKQJT), shuffle them, and deal them between two people. Someone leads a card and the other must follow suit. The winner leads the next card. If you want you can keep a cumulative score that is tricks won over 5, and the winner might be the first to, say, 10 or 20 points. This game lets kids figure out establishing suits, stoppers, and endplays by themselves with no instructions whatsoever. They will also be practicing visualising the opponent’s hand and making plans several tricks long (e.g. I’ll lead my KQJT, then try and win a trick, then cash my QJT). When they learn bridge they will start with some intuition about how to play the cards. Best of all you only need two people to play, so they can practice away from bridge lessons (they may not be able to find enough willing family members to play whist or mini-bridge). Anyone know the name of this game? Suggestions? Honors honeymoon bridge?